Few things on Earth are as miraculous and vital as seeds. Worshipped and treasured since the dawn of humankind, these subtle flecks of life are the source of all existence. Like tiny time capsules, they contain the songs, sustenance, memories, and medicines of entire cultures. They feed us, clothe us, and provide the raw materials for our everyday lives. In a very real sense, they are life itself. Yet in our modern world, these precious gifts of nature are in grave danger. In less than a century of industrial agriculture, our once abundant seed diversity—painstakingly created by ancient farmers and gardeners over countless millennia—has been drastically winnowed down to a handful of mass-produced varieties. Under the spell of industrial “progress” and a lust for profit, our quaint family farmsteads have given way to mechanized agribusinesses sowing genetically identical crops on a monstrous scale. Recent news headlines suggest that Irish history may already be repeating in our globalized food system. Articles in the New York Times and other mainstream sources report the impending collapse of the world’s supplies of bananas, oranges, coffee and coconuts—all due to a shortsighted over-reliance on a single, fragile variety. Without seed diversity, crop diseases rise and empires fall. More than a cautionary tale of “man against nature,” the remarkable story of seeds is an epic “good-versus-evil” saga playing out in our modern lives. For eons, cultures around the world have believed seeds to be our birthright: a covenant with the earth shared by all and passed down across generations. But today, our seeds are increasingly private property held in corporate hands. A cadre of ten agrichemical companies (including Syngenta, Bayer, and Monsanto) now controls more than two-thirds of the global seed market, reaping unprecedented profits. Genetically modified crops (GMOs) engineered in their sterile laboratories dominate farmers’ fields and dinner tables in the United States and countries around the world. People everywhere are waking up to the vital importance of seeds for our future. In recent months, March Against Monsanto protests have rallied millions in more than 400 cities and 50 countries to the cause of seed freedom. Ballot initiatives to label genetically modified foods have been proposed in U.S. cities from California to Connecticut—a direct threat to the profits of the Gene Giants and their Big Food cronies. Seed libraries, community gardens, and a new generation of passionate young farmers are cropping up to shift the balance toward a more sustainable and sovereign seed paradigm. A David and Goliath battle is underway, and the stakes couldn’t be higher. 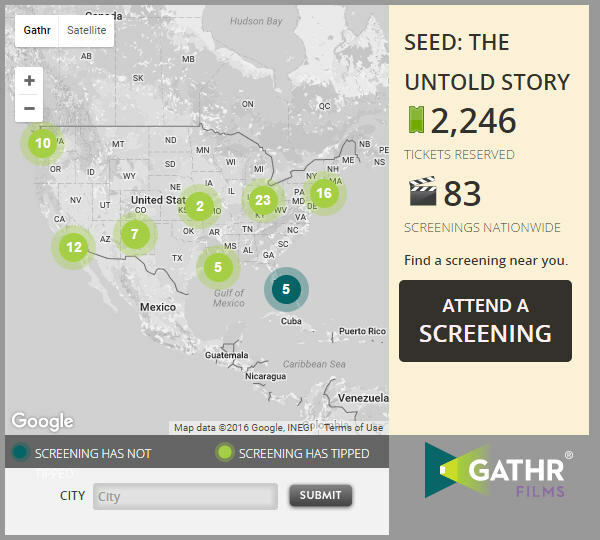 Search for your city or zip code on map to see the screenings in your area. Click on the map link for the screening you want to attend and reserve your tickets today.